LeEco, earlier LeTV, is planning to launch their next generation smartphone which will be the successor of popular Le 1. 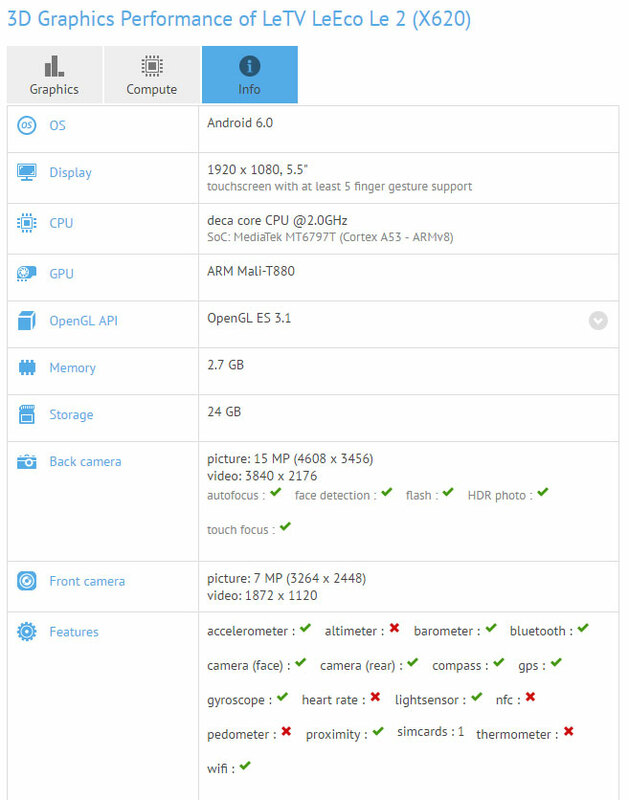 The upcoming device, LeTV Le 2, has been spotted in the database of GFXBench which has disclosed few specifications of the phone. According to the listing, Le 2 will come with Android 6 Marshmallow out of the box. Recently LeEco has mentioned that there will an event that will be held on 20th April, so we can expect that Le 2 might get announced on that day. Le 2 will feature a 5.5 inch full HD display that will posses a resolution of 1080 x 1920 pixels. According to the listing, Le 2 might come with MediaTek Helio X25, which is the same SoC that will be fitted in Meizu Pro 6. Helio X25 is a deca-core (10-core) chipset which is the fastest SoC from MediaTeK till date. Le 2 will run on 3GB RAM for smooth multi-tasking accompanied with Mali-T880 to handle the graphics. The device will come with 32GB of internal storage but there is no information about the support for external memory card. It will sport a 16MP primary camera and a 8MP front camera. The primary camera is capable of recording videos in 4K resolution. The device is expected to support both 3G and 4G networks along with USB Type-C port and fingerprint sensors. The other features include Wi-Fi, Bluetooth, GPS, Accelerometer, Gyroscope and a 3.5mm jack, though NFC seems to be missing. There is no further information about LeTV LeEco Le 2 as of now, but we will soon update you about confirmed specifications, features, availability and price of Le 2 in coming weeks.